Cleaning your child’s stuffed animals may seem like a nightmare. You worry you may damage their favorite “lovey” or that it will take days to dry, causing a meltdown at nap time. Never fear, there are multiple ways to wash your child’s plush toys – including options to keep the toys safe while they get clean! I remember my oldest daughter’s stuffed elephant, “Snuzzles”. Everywhere she went, Snuzzles went too. It was always a fight to try and get Snuzzles for a couple hours so I could wash him. I told her Snuzzles needed a bath and he would be back. It didn’t go over so well, but needed to be done! He looked like a million bucks afterwards. Begin by checking to make sure it is safe to wash the plush animal in the washing machine. If the toy has electronic parts that cannot be removed, it needs to be hand washed. The same can be said for animals that are extremely old, have glued-on parts, or that are stuffed with foam balls or beads. Bonus tip: Check the tag of the stuffed animal before cleaning, as some will say “spot clean” or “surface clean”. These toys should not go in the washer! Gather all of the toys that can be machine-washed and head to the laundry room. Examine each closely for removable parts or any small tears – these need to be mended before washing. When you’ve got them ready for cleaning, place the plushes in a mesh laundry bag before putting them in the machine. Place the stuffed animals in the washer. Depending on the size of your washer and the size of the animals, you should be able to wash 2-4 stuffed toys together. It is best to wash stuffed animals in a machine without an agitator, as this can beat the toys around so much their stuffing gets packed into one side of their body. Set the washer to the gentle or delicate cycle, and only use mild laundry detergent. Clean the stuffed animals with cold water only. Hot can cause glued parts to break off. If you are concerned for the stuffed animals for any reason, hand washing may be a better option. Fill the sink with cool water and fully immerse the animals in to ensure a deep clean. Use a gentle detergent and scrub the toys with your hands to get them clean, making sure to thoroughly rinse the plushes before drying. Once your child’s stuffed animals are clean, you need to make sure they are completely dry before tossing them back in the toy box. If you’re cleaning on a warm, sunny day, hang the toys outdoors to dry. The sunlight also helps to sanitize the toy and the fresh air can help neutralize any lingering smells. If the sun isn’t out, you can let them air dry in your home, over the bathtub in case they drip. For toys that are needed before bedtime, a dryer on low heat is also an option. Just be aware that the heat can damage the stuffed animal if not careful. It’s best to put the animal in the dryer with a few toys to soften the blow of being tossed around in the machine. You might also like these Beauty and the Beast toys or how to organize a playroom. 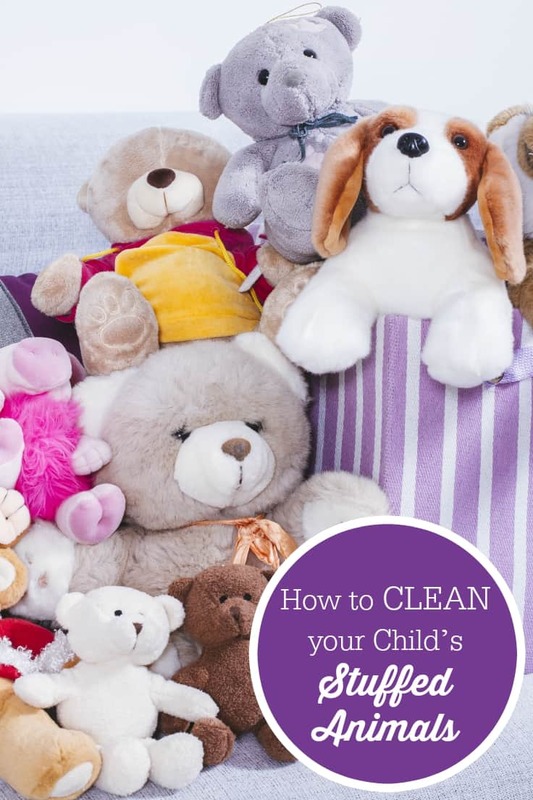 How do you clean your child’s stuffed animals? Thanks for the tips. The stuffies get dragged through so much of the house and yard it’s good to be able to clean then properly. Great tips. Generally we try to sun dry the animals and wipe them down with like baby wipes. We have so many stuffed animals! These are great tips and we usually wash ours in the machine!